These works are a form of mapping: points of interaction and entanglement. I am exploring the tension between ambivalence versus our longing for truth. I have found the counter-intuitive concepts of quantum mechanics to be a liberating framework for thinking about these disjunctions. In quantum mechanics, entanglement is a state where particles influence each other regardless of time and space, and that by looking at something we alter it. It feels as though I am revealing what is already there, unseen, under the surface. I am not sure if something is growing or petrified; branching, fracturing, fissuring? And on what level is this occurring: sub-atomic, cellular, or emotional? 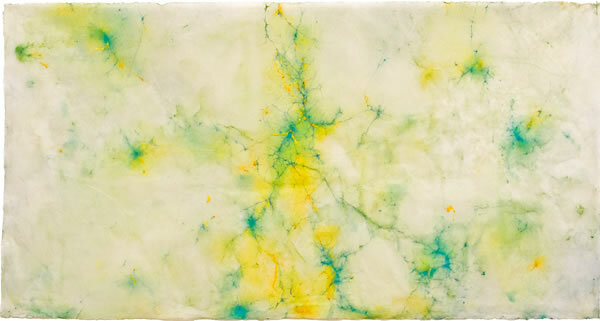 My work is labor intensive: I paint on Japanese paper with transparent encaustics and then, in a very physical process, I rub pigment onto the paper or melt it off, adding and removing until I am satisfied; sometimes the paper becomes so worn that holes or tears occur. Then I draw with a nib pen on the painting by pricking and dotting the surface with ink. I rework the surface, scraping away ink and wax, but traces are left behind. The presence of a hand remains.